Who’s ready to discover a new nail polish line?? Not only is this line made in the US and is kid-friendly, it’s also natural, vegan, and “5-Free” (if you are just as lost as I was on what this phrase means….click here to have it explained! 😉 And the line has a lot of really fun colors — and glitter polishes, too! Highly concentrated serum infuses skin with Dead Sea Minerals, Green Tea, Seaweed, Vitamin C and much more. Protects skin from pollutants and weather damage that can clog pores and cause wrinkles and breakouts. Use as a base under your moisturizer or anti wrinkle cream for maximum anti aging effect or use just the serum. rich serum designed to effectively smooth and firm the skin. naturally regenerate – creating a firmer, more youthful appearance. that can clog pores and cause wrinkles and breakouts. reduce signs of aging and your skin’s elasticity and firmness. naturally restore its youthful health and appearance. I’ve been able to review a few of Adovia’s products and I like how they package all of their products. It’s very clean and polished looking. The Adovia Mineral Lift Facial Serum was in a smoky-glass bottle with a pump to dispense the product. I love liquid products that come with a pump, as it allows the product to stay clean and bacteria-free, so that was a major plus with this item. The bottle came encased in a really attractive box that ensured it arrived to me undamaged – and it did. They were really fast about shipping out this product, which is another bonus! Well, the fact that the bottle came broken might be seen as a dislike, but I can’t really make that claim — it was probably just a fluke, and since they were so quick to offer me a replacement, I in no way thought this downgraded the product. I liked the way the serum felt on my skin. I’ve never used a serum of any kind before this, but I certainly like having it in my routine now. 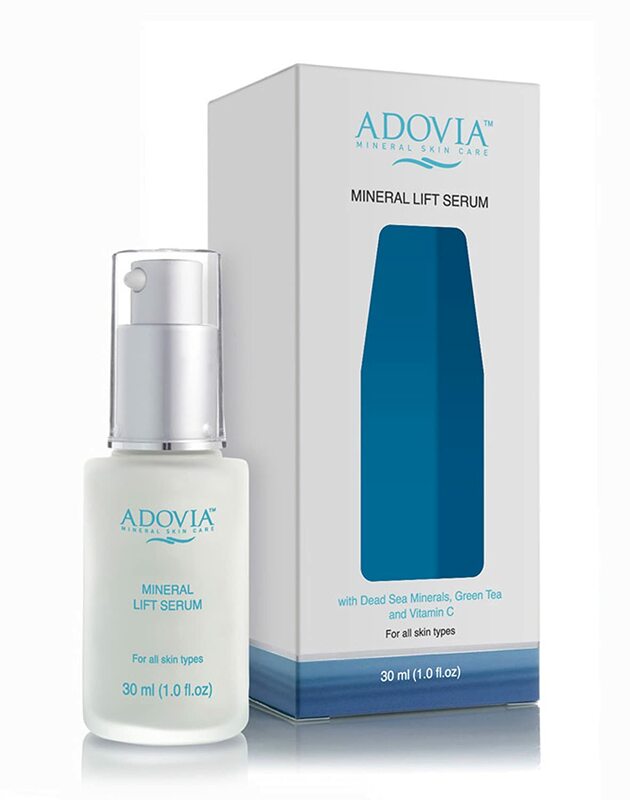 🙂 The price for the Adovia Mineral Lift Serum is on the high-end side — $49 — but if you are the type who wants to spend the money on worth-while skincare products, then this might not be so steep for you. I haven’t been using this product enough to see how much of a difference it made to my skin. I don’t really have skin that needs a ‘lift’ yet, but appreciate that those ingredients are in this serum — you can never start too soon on your anti-aging products, so I’ve heard. 🙂 All in all, this is a really wonderful product. If you are in the search for a moisturizing serum that will give your skin the vitamins it needs, I would recommend looking into this product, for sure! I was really excited to get the opportunity to try out the Kitchen Guru’s Glass Top Kitchen Food Scale. When I first pulled it out of the box, I really liked the edgy, sleek design that makes it both nice to display on the counter and easy to store in the cabinets — whichever you want to do. I received the black one and love the appearance of it! It’s really thin and compact, and the digits on the screen are a good size so that you can easily see them. There is honestly nothing about this scale that I consider a ‘dislike’. The price is normally $35, but right now it’s on sale for only $25. Which is a pretty good price on a high-quality scale that will last you forever! My biggest ‘like’ for this is definitely the design. I LOVE how sleek and smooth it is! I’m so glad to be “almost” back into blogging again. I really missed interacting with you guys on here! Anywho, let’s dive into this review! I really love the look of these journals! Lavishy sells many different designs, but this is the one that stood out to me the most, and seeing it in person is even better. I love the warm tan/brown/black color of the background and I think the bird (a swallow, I believe) is so pretty! And there are other cut little decorative items randomly sprinkled on the front and back cover — from a 10 cent stamp to the tips of a leaf. I love everything about the look of this journal! The journal has a really nice strap around it that helps keep the book closed. I like that little”protective” touch to the journals. I know it doesn’t do a whole lot (it’s not like it locks it away from prying eyes), but I always like some sort of closure on my journals. And the strap/band isn’t super tight or anything, letting you easily slip it on and off whenever you want to open the journal. The spine of the journal is pretty tight, so this definitely isn’t the journal that will just flop open and stay open, so keep that in mind. I don’t mind that fact at all. There’s a little pocket included in the back, which is really neat. I like the idea of being able to put little pieces of paper back there and know it’s secure. I always tend to stick random papers in my journal, so this aspect of Lavishy’s journals is definitely a plus! I am not sure how well the spine of this book will hold up over time, but that might be the only negative part to these journals…maybe. 🙂 The price is pretty good — $12 for a journal. But the fact that they are journals made from recycled wood-free paper is pretty neat. Especially if you like to buy more Eco-friendly material — this journal would definitely be something worth checking out. This giveaway is hosted by Tomoson.com, and there’s only a few more days left to enter. So if you are interested in winning one of these journals, make sure you enter TODAY!!!! Don’t miss out — anyone can enter!!! Okay, on to the first impression review for today! This Dead Sea Mud Mask contains 30 Treatments which lasts for 3-4 Months. Each treatment provides the ingredients and results of a $120 facial at a high end dermatology spa! Made with Pure Dead Sea Mud with the highest concentration of minerals – vital for facial skin treatment glow. This mask is made in Israel – by the Dead Sea experts and contains the highest and freshest concentration of Dead Sea Mud. Reduce Oil and Blackheads and get more clear and radiant skin. Works great for Eczema and Psoriasis as well due to Dead Sea salt and mud known properties that help relieve Eczema, Psoriasis and acne symptoms. The mud mask is packaged really professional looking and the design on the tube is simple, yet attractive. Initially I was under the impression that this Adovia Purifying Mud Mask was rather expensive. But while it is $30 a bottle, you get a little over 5 fl oz of product in this tube. Which will last you quiet a while, as you don’t need much each application. And even less if you’re just spot treating a few areas. Because I already have a routine for my weekly face mask and I didn’t want to change it up so close to my wedding 🙂 I decided to try this mask out as a spot treatment. I’ve used this about three times so far, and really like the results I get. It’s a thick consistency, making it easy to apply over your face without making a mess. I give it a good 20 minutes to dry, then wash it off. I get some cystic acne every now and then, and that’s where I used this mask. I noticed that it helped the redness go around and my pimple didn’t look as inflamed after I washed off the mask. And it resulted in the pimple going away faster than my cystic acne usually takes to run it’s course. 🙂 This, of course, is an awesome fact that really makes me like this product! I really like the Adovia Purifying Mud Mask! I have very oily/acne-prone skin, so masks have always been a must in my skincare routine, and this is something I’m thrilled to add to my regimen! I’m really looking forward to seeing the long-term benefits of using this mask. The company is great to work with. Really quick to ship, too, as I received my product in less than a week from when my order processed. I was impressed! This mask is recommended for people who suffer from acne, oily skin, blackheads, exzema, and psoriasis. So if you are issues with any of these, I’d encourage you to give this mask a try! These Teardrop Dazzle Earrings will look fabulous on you! Four dangling gold colored drops hang approximately 3 inches. I was thrilled to get these gold dangle earrings in the mail the other day! 🙂 On first impression, they seemed a big larger than what I am used to, but I was up to trying it out! They wear really well in your ears. With them being about 3 inches long and looking heavy, you would think it would stretch and/or hurt your ear lobe. But they are actually quiet light! There are four teardrop-shaped pieces on each earring and, for me, it dangled down to hit above my shoulder. They wear very comfortably in my ears and weren’t loud or distracting at all. They do clank together when you move, but not very loud. I, personally, do not tend to wear large earrings or statement necklaces, but I’m not opposed to trying the style out! Which is why I was very happy to get the opportunity to review a product from Majestical Jewelry. I feel that these earrings would be better if you had a matching gold chain necklace to go along with it. Pairing that with a solid top would look very pretty, I think. Unfortunately, I don’t have a gold necklace, but it’s now on my ‘to look for’ list and I look forward to wearing it with these earrings on some occasion. So, my final thoughts on this product. At first appearance they seem a little clunky, but I think they grew on me. I like them and look forward to finding a necklace to go with them. And for the price — under $10 — these earring are pretty nicely made. They would be a great addition to your jewelry collection. Majestical Jewelry has very affordable prices for their jewelry. I would definitely check out their website if you are in need of some statement pieces to go along with your outfits.